Abstract: The recent literature shows that extreme temperatures have an adverse effect on the yield of major crops in different parts of the world. This paper investigates the impact of exposure to extreme temperature on crop yields of a range of crops cultivated in the State of Karnataka, India. The crops examined in this study are rice, sorghum (jowar), finger millet (ragi), and pigeon pea. We use a taluk-level fixed effects panel data model to study the impact of exposure to extreme temperatures, measured in terms of extreme degree days, on crop yields. Crop yields are the dependent variables and total seasonal rainfall, growing degree days (GDD) and extreme degree days (EDD) are the independent variables used in this model. The paper finds an inverse linear relationship between yield and extreme degree days. The impact of extreme temperature on yields (EDD) was greater than the impact of rainfall and GDD. The regression coefficients were checked for robustness using quantile regression methods. For most crops, the sign of the coefficient of EDD was consistent for the 25, 50, and 75 per cent quantiles of estimation. This suggests that the inverse relationship between EDD and crop yield holds for the different quantile levels. This study is perhaps the first of its kind in southern India and for crops other than wheat. It focuses on climate and climate variability, and clearly shows that exposure to extreme heat is the most important effect of climate change on agriculture that can be currently observed in Karnataka. Keywords: Karnataka, climate change, crop yield, extreme temperature, extreme heat, growing degree days, extreme degree days, rainfall, taluk, rice, sorghum, finger millet, pigeon pea, climate variability, fixed effects, quantile regression. Rainfall and temperature are perhaps the most important climatic determinants of vegetative growth, and variations in these have the potential to limit the growth stages of a crop and thereby affect crop productivity. Much of the literature until recently has focused on changes in the mean value of climate variables as determining the impact of climate change on agricultural yields (Thornton et al. 2014). Within this, precipitation is considered the key factor (Lobell and Burke 2008). More recent literature, however, has pointed to the significance of other climate parameters including those that capture aspects of climate variability, including the distribution of rainfall over a period of time, and exposure to extreme temperatures during various phases of crop growth (Asseng et al. 2015). It is useful to distinguish between climate variability in the past and climate change that will occur in the future. We can think of the climate change that occurred in the past as having been absorbed into adaptation and standard practical and theoretical knowledge in agriculture science. Climate change that will occur in the future, however, can only be predicted by climate science models, including studies that examine the impact of climate variability of the past and present. Plant response to temperature variation differs across crops (Hatfield and Prueger 2015). Nevertheless, for most crops, atmospheric temperature around the optimum level is an important factor for proper growth in different phenological stages. If the temperature crosses the optimal level, it has a negative effect on crop growth. There is a body of evidence on the impact of an increment in mean temperature on yield of different crops. For maize, a 1°C rise in temperature can result in a yield reduction of 3-10 percentage points depending upon the geography. The corresponding reductions in yield for a 1°C rise in mean temperature of the crop season are close to 6 per cent for rice, and 3-7 per cent for soybean (Lobell et al. 2007; Rosenzweig et al. 2013; Schlenker et al. 2009; Zhao et al. 2017). Exposure to temperatures exceeding a critical threshold can have a devastating effect on a crop and sharply reduce productivity (Lou 2011). Crops are more sensitive to exposure to higher than critical temperatures during the reproductive and grain-filling stages of crop growth (Teixeira et al. 2013). For agricultural plots with low resource use (in terms of availability of water through irrigation or inadequate application of necessary soil nutrients), the exposure to even a short period of extreme temperatures can result in productivity losses (Seibert et al. 2014). This phenomenon has been widely recognised by crop modeling researchers (Asseng et al. 2011; Asseng et al. 2015). Existing crop models, however, have not yet been able to capture the mechanisms by which exposure to extreme temperature affects crop physiology (Lobell et al. 2012). In a comprehensive assessment of crop models, Asseng et al. (2015) found that most models are less accurate in their estimation of wheat yields when simulating exposure to extreme temperatures than when simulating exposure to mean temperature. A similar observation was made by Lobell et al. (2012) when simulating effects on wheat productivity in the Indo-Gangetic plain. Studies of the effects of exposure to extreme temperatures on crops, based on crop production data, have been mainly for major growing regions of crops such as wheat (Lobell et al. 2012; Powell and Reinhard 2016), rice (Welch et al. 2010), maize (Schenkler et al. 2009; Lobell et al. 2013), and cotton in the United States (Schenkler et al. 2009). This paper attempts to study the impact of exposure to extreme temperatures on the yields of selected crops in Karnataka State, India. The impact of exposure to extreme temperature events is gauged using annual time-series of data on crop productivity for 20 years at the taluk (sub-district) level. We also use quantile regressions to assess the robustness of the relationship between extreme temperature and crop yields. Although the study is limited to Karnataka, the findings may be of general relevance for other crops and regions in south India. Section 2 provides a critical overview of some aspects of agriculture and climate change in Karnataka, section 3 describes the data and methods used in the analysis, while section 4 discusses results of the analysis. Section 5 summarises the main conclusions of the study. Karnataka is in Southwest India. The State is divided into 30 districts and 176 taluks with a total of 27,481 villages. Agriculture is the major occupation for a majority of the rural population. According to the population Census of 2011, agriculture supported 13.7 million workers, of whom 24 per cent were cultivators and 26 per cent were agricultural workers. A total of 123,100 sq km of land is under cultivation in the State, constituting 65 per cent of its total geographical area (Bhende 2013). Five million hectares are under rainfed cultivation. This is the second highest, after Rajasthan, among States. The agricultural sector of Karnataka is characterised by a large number of drought prone regions and scattered patches of irrigated land. Thus, with its existing agro-climatic and resource constraints, a large section of agricultural land in the State is exposed to climate risk. Karnataka’s agriculture is characterised by wide crop diversification and remains highly dependent on the southwest monsoon. Karnataka has been divided into 10 agro-ecological zones. These agro-ecological zones are identified by rainfall quantum and distribution, soil types, soil texture, depth and its physio-chemical properties, elevation, topography, major crops, and type of vegetation. Agricultural production in the State is spread over three seasons namely, kharif (July to October), rabi or winter (October to March), and summer. The agro-climatic conditions of the State permit the cultivation of different types of crops. The important crops cultivated are cereals including rice, sorghum (jowar), pearl millet (bajra), maize, wheat, finger millet (ragi), and other minor millets; pulses including pigeon pea, bengal gram, horse gram, black gram, green gram, and cowpea; oil seeds including groundnut, sesamum, sunflower, and soybean; and commercial crops such as sugarcane, cotton, and tobacco. Some crops such as pearl millet, pigeon pea, minor millets, sesamum, castor, and ginger are purely kharif crops. Wheat, sorghum, and safflower are cultivated in the rabi season. Cereal crops such as rice, sorghum, finger millet, and maize can be grown in all seasons. Pulses too are grown in all seasons. Among oil seed crops, groundnut and sunflower can be grown during all seasons. In Karnataka, kharif crops are cultivated in all the agro-climatic zones whereas the rabi crops are mostly cultivated in the northeastern and northern dry zones. About 77 per cent of the total geographical area of the State is arid or semi-arid. Drought is a threat to reckon with as two-thirds of the State receives less than 750 mm rainfall per annum. Karnataka ranks second in India, next only to Rajasthan, in terms of total geographical area prone to drought. Around 54 per cent of total geographical area of the State is drought prone. The spread of irrigation to many parts of the State was one of the major factors that led to agricultural growth between the 1950s and 2000 (Ramakumar 2017). Between 1970-71 and 2011-12, the net irrigated area in the State rose from 1,137,000 hectares to 3,440,000 hectares and the share of gross irrigated area in gross cropped area rose from 12 to 34 per cent. Most of the growth in irrigation occurred after 2003-04. Canals and wells were the major source for the rise in irrigated area in the 1970s, while tubewells and bore wells were the major source for the rise in irrigated area in the 2000s. In the sixties, the northern parts of Karnataka were dry regions with poor irrigation facilities, and this was considered to be one of the primary reasons for the relative backwardness of the northern regions as compared to the southern regions of the State. If we look at the data for 1973-74, the share of net irrigated area in net sown area was 2 per cent in Gulbarga, 4 per cent in Bidar, 5 per cent in Bijapur, 6.5 per cent in Dharwad, 10 per cent in Bellary, and 13 per cent in Belgaum. On the other hand, the share of net irrigated area in net sown area was higher, on average, in the southern districts of Karnataka with some extremely well irrigated districts (Ramakumar 2017). To illustrate, in 1973, the share of irrigated area in net sown area was 44 per cent in Shimoga, 40 per cent in Dakshina Kannada, 32 per cent in Mandya, and 21 per cent in Kolar. The districts of Shimoga and Mandya were largely irrigated by canals from the Tungabhadra and Kaveri rivers. By 2011–12 the situation had drastically changed: while 42 per cent of land in the southern dry zone was irrigated, the northern dry zone was also irrigated to the extent of 38 per cent. Changes in irrigation in Karnataka have partly led to important changes in cropping pattern in the State. Ramakumar (2017) notes two important findings in this regard. First, it is clear that the new crops - maize, pigeon pea, sugarcane, and sunflower – have been cultivated in districts where the extent of irrigated area has risen between 1970s and 2000s. Secondly, there has been a significant increase in the growth of horticultural crops in Karnataka in recent years. While spices and plantation crops like coffee have historically been a major part of agriculture in Karnataka, the recent increase has occurred in the cultivation of fruit, vegetables, and commercial flowers, and not in traditional plantation crops. The current and future pattern of climate change and climate variability for Karnataka is discussed in detail in the Karnataka Climate Change Action Plan Report of the Bangalore Climate Change Initiative – Karnataka or BCCI-K (2011), while the Environmental Management and Policy Research Institute (EMPRI) and TERI (2012) report titled Karnataka State Action Plan on Climate Change, 1st Assessment, discusses the same issues but not as comprehensively. In fact, EMPRI and TERI (2012) recognise and report the findings of BCCI-K (2011). As far as assessment of the current and future state of climate is concerned, the findings of BCCI-K (2011) constitute the benchmark, with no other comparable study to date, and so we focus here on the methodology and findings of the BCCI-K (2011). Observed and future climate analysis in BCCI-K (2011) is based on high resolution (0.5° × 0.5° lat. and long.) India Meteorological Department (IMD) daily gridded rainfall data for the period from 1971 to 2005, and 0.5° × 0.5° spatial resolution monthly temperature and precipitation data from the University of East Anglia Climatic Research Unit Time Series (CRUTS) version 2.10, spanning the period 1901 to 2002. District-wise data are obtained by re-gridding the dataset to 0.1° lat. × 0.1° long, and re-aggregating by districts to study the climate variability at district level. In addition, projection of climate was obtained by the combination of HadCM3 and PRECIS models (also known as HadRM3).1 A multi-GCM (General Circulation) model was also used for projection of climatic variables to assess the reliability of the projections of HadRM3. These projections were obtained at the spatial resolution of 0.44° latitude by 0.44° longitude, which was first interpolated to 0.2° in latitude and 0.2° in longitude and then re-aggregated to district-level. Climate projections were obtained for daily values of precipitation and temperature. The following are the highlights of the findings of BCCI-K (2011). The report observed a long-term negative trend of about 6 per cent in precipitation over Karnataka for the period 1951–2004, particularly in coastal and north Karnataka. The northeastern and southwestern parts of the State are projected to experience a fall in the quantum of rainfall, annually and during the southwest monsoon season (from June to September). A steady warming trend was observed with respect to both minimum and maximum temperature over the districts of north Karnataka. Climate model projections show rising temperature, with rainfall fluctuating (but falling in Kodagu and the northeast of the State). Karnataka is projected to experience a warming of 1.8 to 2.2°C by 2030 with respect to the baseline period of 1961 to 1990. The rise in minimum temperature is projected to be slightly more than that of the average and the maximum temperatures. In addition, the minimum temperature will go up by as much as 2.4 to 3.3°C in the winter months (November to February) and the maximum temperature will go up by as much as 2.7°C during the monsoon months (June and November). The report focused on an assessment of variability and changes in the mean state of climate variables such as temperature and rainfall. Not much effort was devoted to describing changes in extreme climate patterns. Observed and projected changes in climate extremes are important, as we have noted above, to assess the impact of global warming that is specific to agriculture. The climatic analysis in the report further made only limited inferences of relevance to agricultural productivity. A careful reading of the report indicates that the chapters on climate analysis and agricultural assessment were written separately and it seems there was no interaction between the two institutions in terms of planning the analysis. This is evident from the fact that the chapter on agricultural impact emphasises the negative influence of extreme temperature on crop yields and provides relevant references for this. However, the chapter on climate analysis does not recognise this fact and only describes the current and future pattern of mean values of climate variables for the State. Jogesh and Dubhash (2014) have also pointed out this problem and remarked that the chapter on agriculture uses different time-scales of data and parameters from the ones employed by the chapter on climate analysis in respect of district-wise rainfall and temperature trends. The chapter on impact of climate change on agriculture uses crop model results combined with the projected rainfall and temperature values from GCMs. The InfoCrop model was used to assess the impact of climate change for maize, sorghum, rice, red gram, cotton, potato, soybean, and wheat. A stoichiometric crop weather model was used to study the baseline (observed) scenario impact of climate on crop production. The impact of climate variables on crops at different phenological stages was assessed. The highlights of the findings of the relevant chapter of the report are the following. It is predicted that regions that already witness lower rainfall and higher temperatures, such as northern Karnataka, will experience even lower rainfall and increases in average temperatures. Both irrigated and rainfed rice will suffer the impact of changes in climate variability. Rainfed rice is particularly likely to suffer greater impact due to higher exposure to such climate change. Increased rainfall can be a surrogate for reduced sunshine duration due to cloudiness, causing limitations on photosynthetic rates resulting in reduced accumulation of dry matter, particularly in areas with high rainfall. The report suggests that increase in rainfall activity in the Western Ghats will negatively influence crop productivity in the region. Further, the chapter suggests that the impact of change in climate may not spare C4 crops such as maize and sorghum. Model based simulation indicates a negative impact on these crops due to climate change. There is also literature on the impact of climate change on sugarcane. Chandran and Anushree (2016) found that for sugarcane yield climatic factors such as minimum temperature and rainfall have positive impact, whereas, maximum temperature has a negative effect. In addition, there are other factors such as fertilizer use and irrigation that have been found to have a positive impact on yield. Furthermore, the authors found that it may not be the rainfall in winter alone that affects the yield of sugarcane in Karnataka, but that rainfall in summer is also significant and has a positive relationship to sugarcane yield. The authors further noted that the climatic variables with respect to minimum and maximum temperatures in different seasons have a very significant impact on the yield of sugarcane and the study points out the varying impacts of these variables in different seasons on sugarcane productivity. Although the existing literature gives a good understanding of the possible impact of climatic conditions on the crop yield in Karnataka, still the role of extreme temperature on crop yield is not explored in detail. The district scale, which is the unit of analysis in the earlier studies, is very likely to include multiple agro-climatic zones and therefore the variation of yield at the district scale may not be appropriately related to the variation in climatic factors. Analysis at a scale smaller than the district (such as the taluk or the hobli), is required to bring more homogeneity in terms of climatic and yield variations. In this paper, we present the impact of climatic variables including extreme temperature episodes on crop yield at the taluk level, which is a more homogeneous agro-climatological unit than the district scale – which is the unit of analysis in the earlier studies. To avoid climatic heterogeneity at the district level, which is a large geographical area, it is desirable to use both yield and climate data at the taluk level or local scale. As daily climate data are not available at the taluk level, we use daily climate data from 28 IMD observatories for the analysis. Climate data include data on daily precipitation and daily maximum and minimum temperatures for the period 1994 to 2013. Figure 1 shows the location of the 28 IMD stations that are used in the analysis. 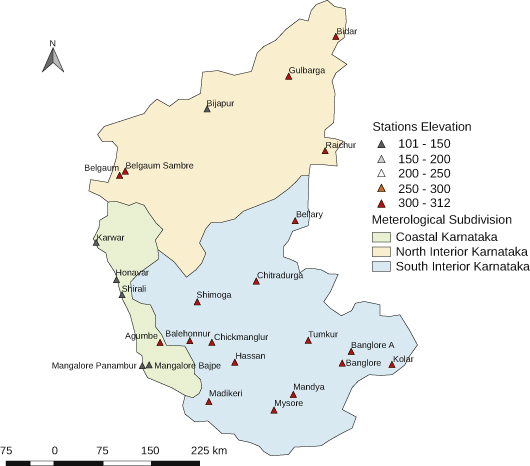 Figure 1 Map showing three meteorological sub-divisions of Karnataka and locations of IMD weather stations, station elevation in meters above mean sea level. We used data on yields from crop cutting experiments, compiled at the hobli level (an administrative unit smaller than the taluk, which is a cluster of adjoining villages administered together). The data were obtained from the Directorate of Economics and Statistics, Government of Karnataka, and cover the period from 1994 to 2013. Hobli-level yield data were aggregated to the taluk level by taking average yield values of all the hoblis falling within a taluk. Extreme yield values were carefully examined and outliers were excluded. For crops in the study, namely rice, sorghum (jowar), finger millet (ragi), and pigeon pea (tur), we use crop yields from both kharif and rabi seasons as appropriate. For rice, yields for both irrigated and rainfed areas were studied separately, while for sorghum, yields from kharif and rabi seasons were analysed separately. We acknowledge the fact that the network of IMD stations is thin and direct use of such data or interpolations based on such data have limitations. Specifically, King et al. (2012) have raised concerns about use of daily rainfall data to analyse extreme rainfall events. The current study uses total seasonal rainfall for the analysis, a variable that is likely to be more homogenous as compared to daily rainfall values (Rajeevan et al. 2006). This study also uses daily temperature values to calculate growing degree days and extreme degree days, which are then aggregated over the crop season. The seasonal aggregate of growing degree days is used to estimate the crop yield-temperature relationship. This approach has fewer limitations as temperature is more homogeneous than rainfall. The use of interpolated values of temperature data, particularly in Indian conditions, has been found to be useful for many applications ranging from heat wave, cold wave to other environment applications (Srivastava et al. 2009). There are a number of methods for interpolation of climate data from weather stations. We used the inverse square weighted distance (ISDW) interpolation method to interpolate daily climatic data from a weather station to a taluk. We choose ISDW method because it is easier to implement and has a similar skill in terms of matching station level observed climatic variables such as temperature, particularly in regions where the topography is not very heterogenous (Hofstra et al. 2008). Climate data from an individual IMD station is interpolated to the centre point of a taluk boundary layer. This interpolation method is based on the assumption that stations that are close to a taluk are more influential, and therefore, the stations that are close to a taluk are given more weight than stations that are farther away. All 28 IMD stations were used in the daily scale interpolation of climatic data. where T is the temperature of a day. The variables Tbase and Topt are crop-specific base and optimum temperature, respectively. We used 8°C as Tbase for all the crops in the study, following Schenkler et al. (2009). This is because the literature indicates that the base temperature for most crops ranges between 5 to 10°C (Lou et al. 2012). The same formula is used for the computation of EDD, but in place of Tbase we used Tcritical. The variable Tcritical is the critical temperature of a crop. For estimation of the EDD, Topt is set as infinity (Lobell et al. 2012). Ideally D should be decided based on information from sowing date and harvesting date. However, information on sowing dates and harvesting dates are not available; additionally, these dates may vary substantially across farmers’ plots in a taluk. Hence the official crop calendar was used for estimation of total rainfall, GDD, and EDD. Details of the crop calendar, TOpt, and Tcritical for the selected crops are given in Table 1. Since the crop calendar is given in terms of entire months, the entire month is included in the computation of GDD and EDD. $ Lou et al. (2012). where yit is crop yield for taluk i in year t. The terms Rit, GDDit, and EDDit are total rainfall, growing degree days and extreme degree days for a crop calendar in taluk i and year t, respectively. The terms β1, β2, and β3 are the regression coefficients for R, GDD, and EDD, respectively. The regression coefficients show the elasticities of crop yield with respect to climatic variables. The term αi refers to time invariant taluk fixed effect to control for taluk specific characteristics, the term εit shows the error term that is random in nature and assumed to have a normal distribution. The least squares regression estimation works on the conditional mean of the response variable given the values of the predictor variables. The issue related to fitting a regression to a conditional mean is that the coefficients may get influenced by the presence of an outlier in the estimation. Quantile regression (Koenker and Bassett 1978) extends the concept of percentile or quantile in the regression and estimates regression relationships of the response variable with respect to the quantile or percentile of the independent variables. The advantage of quantile regression is that it helps in assessing whether the regression estimation of the predictor variable is statistically robust in terms of its sign (that is, the positive or negative influence of the variable on crop yield). Yu et al. (2003) have suggested a number of areas where the quantile regression approach can be successfully applied. Here, we apply the concept of quantile regression to ascertain whether the estimations of regression coefficients are consistent for different quantiles of the distribution of the independent variable. where Qτ,it(y) is the quantile of a response variable y for taluk i and time t, at quantile level τ, where 0 < τ < 1. The response variable is crop yield in this case. The terms β1(τ), β2(τ), and β3(τ) are the coefficients of regression, at τ quantile level, for seasonal total rainfall, GDD and EDD, respectively. The term αi(τ) refers to time invariant taluk fixed effect to control at τ quantile level, and εit is random noise. We used three levels of τ (at 0.25, 0.5, and 0.75 quantiles) to assess the robustness of the coefficients of seasonal rainfall, GDD and EDD. We check for the consistency of the sign at three quantile levels of the regression coefficients to test the robustness of their relationship with crop yield. Figure 2 shows the long-term average rainfall, for the period from 1901 to 2010, for the three sub-divisions of the State. Panel (a) shows annual rainfall climatology of the three meteorological sub-divisions: coastal Karnataka, north interior Karnataka, and south Karnataka. Panel (b) shows the contribution of the southwest monsoon to total rainfall. 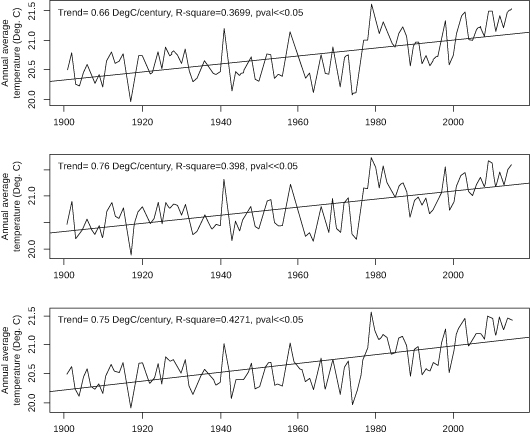 Panels (c), (d), and (e) show 50-year distributions of annual rainfall pattern for 1901–1950 and 1961–2010 periods. Clearly, coastal Karnataka is a very high rainfall region with annual rainfall in the range of 2500 to 5000 mm. Both north and south Karnataka receive annual rainfall in the range of 500 to 1500 mm. A 50-year analysis of annual rainfall pattern of the three sub-divisions for the time periods 1901–1950 and 1961–2010 is shown in panels (c), (d), and (e). 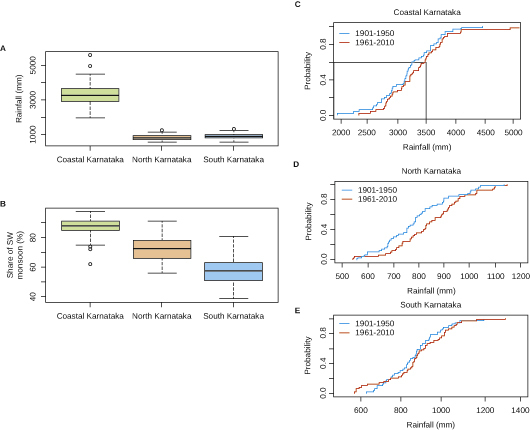 We tested and found a significant change in rainfall distribution in north Karnataka over the two 50-year periods, with a statistically significant increase in rainfall at all percentile levels. Coastal Karnataka also shows a statistically significant increase in rainfall, and in particular the years of extreme high have increased from the number observed in the 1901–1950 period. For south Karnataka, there is a statistically significant increase in the likelihood of years with rainfall less than 600 mm, indicating an increased likelihood of drought, although the number of years of higher rainfall has also increased. Figure 3 shows the long-term trends in temperature for the three meteorological sub-divisions of the State. Coastal Karnataka shows a significant increasing trend that is close to 0.66°C per century. Trend estimates for north and south Karnataka suggest an increasing trend of the order of 0.75°C per century. All trend estimates are statistically significant at 95 per cent confidence interval (statistical details of the trend estimation are given in the top left corner of each panel of Figure 3). Note: The panel on the top is for coastal Karnataka, the middle panel for north Karnataka, and the bottom panel for south Karnataka. The observed shift in the mean state of temperature and rainfall is likely to influence the occurrence of extremes, which is of relevance to agricultural production. Figure 4 shows the number of days when the temperature exceeded the 33°C and 40°C thresholds. Analysis of the data suggests that there are a significant number of days in a cropping season when the daily temperature is above the critical threshold. North Karnataka, in particular, is exposed to a higher number of hotter days (hotter than the threshold). In most districts, we observed the occurrence of extreme temperature days. This is a concern since the exposure of crops to extreme temperature has negative consequences for crop production and productivity. Figure 4 Number of days with daily temperature above 33°C and 40°C for kharif and rabi season. Note: The panels (a) and (b) for kharif and rabi season are at the threshold 33°C, respectively. The panels (c) and (d) for kharif and rabi season are at the threshold of 40°C. Earlier studies have found that exposure to extreme temperatures across wheat-growing regions has a negative effect on productivity during the reproductive phase of the crop (Lobell and Field 2007; Lobell et al. 2012). The analysis of temperature records suggests that most regions of India are exposed to extreme temperatures. This is a concern for productivity in regions that have limited access to irrigation facilities. In the case of Karnataka, the impact of extreme temperatures on crop productivity has not been thoroughly studied. This is important since a significant proportion of cropped area in the State lacks irrigation and also grows temperature sensitive crops such as rice, sorghum, finger millet, and pigeon pea. We now turn to the results of taluk-scale fixed effect regressions, based on equation 3 (Table 2). Notes: *** Significance at p-val< 0.001, ** Significance at p-val <0.01, * Significance at p-val <0.05, and ^ indicates significance at p-val<0.1. For irrigated rice grown in the kharif season, only the coefficient of EDD was statistically significant, and negative. While the coefficient of GDD was also negative, it was only significant at the 90 per cent confidence interval. Further, the magnitude of the EDD coefficient was higher than that of GDD and rainfall. The regression model has a high R-square (0.64), suggesting a strong linear relationship. In the case of unirrigated rice grown during kharif, total rainfall during the growing season was positive and significant. The effect of EDD was weaker (and only significant at the 10 per cent level of significance), as expected, since rainfall is critical for an unirrigated crop. Nevertheless, this model too was significant with an R-square value equal to 0.62. Together, these equations show that with 33°C as the critical threshold of temperature, EDD or extreme degree days above 33°C have a negative impact on rice productivity. This result is in line with the findings of Bheemanahalli et al. (2016) who argued, from field trial data, that exposure to temperatures above 33°C affects the reproductive activity of the crop, and thereby crop productivity. Turning to sorghum grown in the rabi season without irrigation, all three climatic parameters had a statistically significant influence on yield. The coefficients of rainfall and GDD were positive while EDD was negative. In terms of magnitude, EDD had the largest impact on yield. Results for the kharif season were different, with rainfall showing no effect. However, GDD had a significant positive effect and EDD had a significant negative effect. Again, the magnitude of the EDD coefficient was the largest. Putting both results together, EDD has a strong negative impact on yield of rainfed sorghum. In the regressions for pigeon pea and finger millet, only EDD was negative and significant. In summary, the estimations show that EDD is a consistently influential factor in determining crop yields than seasonal rainfall and GDD, with a significant negative influence in all but one case. In addition, the negative impact of EDD was much stronger than the positive effects of seasonal rainfall and GDD. In other words, exposure to an extreme temperature that exceeds the critical threshold of the crop has a strong negative effect on yield. This observation is of consequence since there is an increasing tendency of daily temperature to exceed the critical thresholds for crop growth (Gourdji et al. 2013; Tiexeria et al. 2013). We examined the regression coefficients for the EDD at 0.25, 0.5, and 0.75 quantile levels. These quantile levels represent the variation of the yield around the median of the distribution. These quantile levels were selected so as to ascertain that the results of the regression estimators, as shown in Table 2, are valid for the centre of the distribution of the yield of an individual crop. Table 3 shows the results of the quantile regressions between crop yield and three climatic variables. In the evaluation of these regression coefficients at different quantile levels, if the sign remains unchanged at different quantile levels, we conclude that the relationship (whether negative or positive) is valid and consistent with the centre of the distribution of yield variation. As for most crops the influence of EDD on yield is negative, we focus on estimation of EDD at different quantile levels. In the case of irrigated rice sown in the kharif season, the linear regression showed EDD to be the only significant factor. The quantile regression confirms that the statistically significant negative relationship of EDD on rice yield is consistent (Table 3). For unirrigated rice, we had observed a positive coefficient of seasonal rainfall on crop yield but this is not consistent at different quantile levels. The results for GDD are similar. Interestingly, the EDD coefficients show a weak statistical significance in the linear regression (Table 2). The coefficients of the EDD at different quantile levels suggest that the estimates have weak statistical significance, but are consistent at different quantile levels. This suggests that EDD has a robust negative impact on yield of unirrigated rice in the kharif season. The results for the EDD coefficients of the quantile regressions are also consistent for unirrigated sorghum grown in the rabi season, but for GDD and rainfall, the results are not consistent at the three quantile levels. For unirrigated sorghum in the kharif season, the results of the quantile regression are not consistent for all variables, suggesting that the influence of rainfall, GDD, and EDD on yield variation is not conclusive. The negative relationship of EDD on yield was significant for finger millet and pigeon pea (Table 2). The result is not consistent across the three quantiles in the case of finger millet. For pigeon pea, however, the negative relationship is highly consistent across the three quantile levels. This implies that we cannot confirm the negative influence of EDD on finger millet, but the negative effect of EDD on yield of pigeon pea is conclusive. To conclude, the regression coefficients are robust as their signs did not change across quantiles for most of the crops studied. Our results point to a strong negative influence of exposure to extreme temperature on crop yields. In the fixed effects model used in this paper, it is assumed that variations across taluk are only in the intercept term. This may not be appropriate because the geographical and climatological characteristics for districts and taluks are not the same. To evaluate differences across agro-climatic zones, we estimated a taluk-level fixed effects model separately for north and south Karnataka (Appendix Table 1). We excluded coastal Karnataka because of fewer data points (it has only three districts). Again, the results show that EDD was the most important variable for crop yield, with a negative effect on yield. This observation is consistent with our observation from the fixed effects model for the entire State. However, the coefficient of EDD was not statistically significant for all crops in north Karnataka: the coefficient was significant for rabi sorghum and kharif pigeon pea (two important crops of the region). The negative influence of EDD on crop yield was observed for all crops in south Karnataka. The estimates for unirrigated sorghum grown in the rabi season are consistent in terms of magnitude and statistical significance for the entire State, north Karnataka, and south Karnataka. A comparison of the State and zonal regressions also shows that the influence of EDD is consistently negative and higher in magnitude than estimates of total rainfall and GDD. In this paper, we estimated the relationship between crop yields and climatic variables for selected crops grown in Karnataka. The three main climatic variables that we chose were total seasonal rainfall, total heat exposure in terms of growing degree days (GDD), and exposure to above critical temperatures in terms of extreme degree days (EDD). We explored the possibility of a linear relationship between variation in crop yields and the three climatic factors at the taluk level. Taluks were considered as the spatial unit for analysis as they are likely to be more spatially homogeneous with respect to temperature and rainfall pattern than the district. The major findings of our study are the following. Long term data on annual average temperatures indicate a statistically significant increasing trend, with a range of 0.6 to 0.75°C per century for different sub-divisions of the State. The rising trend in temperatures in Karnataka points to the possibility of warmer growing seasons and greater likelihood of extreme temperatures in the future. These are matters of serious concern for agricultural productivity in the region. District-wise analysis of data on temperature suggests a warming trend in the seasonal average temperature for kharif and rabi seasons. These trends are higher than the corresponding trends in three IMD sub-divisional annual averages. Thus, it is possible that there will be a rise in the number of days in a year in which there are higher crop-specific threshold temperatures. Extreme temperature days occurred in many districts. The paper used a fixed effects linear regression model to estimate the relationship between variation in yield and three climatic variables for specific crops. The estimated regressions suggest that EDD was an influential parameter in respect of crop yield. It had a significant negative coefficient for most crops. Further, where the coefficient of EDD was significant, it was of a higher magnitude than GDD and rainfall. For irrigated rice, only EDD was significant. By contrast, for rice grown under rainfed conditions, total seasonal rainfall was positive and significant. In the case of sorghum, irrigated and rainfed, both GDD and EDD were significant, though the magnitude of the EDD coefficient was higher. In the case of finger millet and pigeon pea, yields are sensitive to exposure to extreme temperatures, as captured by the EDD variable. Most crops in Karnataka exhibit large yield gaps. While our focus was on the impact of climatic factors on crop yield, we by no means wish to suggest that these are the only constraints on agriculture. Nevertheless, our results emphasise the point that episodes of extreme temperature days will exert additional pressure on the agricultural production in the State. With specific reference to climate and its variability, this paper shows that exposure to extreme heat is one of the important climatic phenomena currently observed in crop production in Karnataka. This study is perhaps the first of its kind for southern India and for crops other than wheat. We found that yields were consistently and significantly low in cropping seasons when exposure to temperatures above the critical thresholds was high. Climate-associated reductions in yield are significant for major crops, especially for monsoon (kharif) rice, irrigated and unirrigated, winter (rabi) sorghum or jowar (unirrigated), and unirrigated pigeon pea in the kharif season. Karnataka needs research on new crop varieties that can cope with heat stress. There is also a need for continued and more intensive research on the impact of climate variability on agricultural production and productivity. Acknowledgements: This paper is based on a project undertaken by the Economic Analysis Unit, Indian Statistical Institute, Bangalore funded by the Karnataka Agriculture Prices Commission (KAPC). We are grateful to KAPC, and to Prakash Kammardi in particular, for supporting this study and to participants of the stakeholder meetings for their comments and suggestions. 1 HadCM3 is the UK Met office based General Circulation Model, which was used for the climate projection in the Indian subcontinent. Asseng, S., Foster, I., and Turner, N. C. (2011), “The Impact of Temperature Variability on Wheat Yields,” Global Change Biology, vol. 17, no. 2, pp. 997–1012. Asseng, S., Ewert, F., Martre, P., Rötter, R. P., Lobell, D. B., Cammarano, D., et al. (2015), “Rising Temperatures Reduce Global Wheat Production,” Nature Climate Change, vol. 5, no. 2, pp. 143–47. Auffhammer, M., Ramanathan, V., and Vincent, J. R. (2006), “Integrated Model Shows that Atmospheric Brown Clouds and Greenhouse Gases Have Reduced Rice Harvests in India,” Proceedings of the National Academy of Sciences, vol. 103, no. 52, pp. 19668–72. Bangalore Climate Change Initiative-Karnataka (BCCI-K) (2011), Karnataka Climate Change Action Plan, Final report submitted to the Government of Karnataka, Bengaluru, available at http://www.lse.ac.uk/asiaResearchCentre/_files/KarnatakaCCactionPlanFinal.pdf, viewed on December 21, 2018. Bheemanahalli, R., Sathishraj, R., Tack, J., Nalley, L. L., Muthurajan, R., and Jagadish, K. S. (2016), “Temperature Thresholds for Spikelet Sterility and Associated Warming Impacts for Sub-Tropical Rice,” Agricultural and Forest Meteorology, vol. 221, pp. 122–30. Bhende, M. J. (2013), Agricultural Profile of Karnataka State, Agricultural Development and Rural Transformation Centre, Institute of Social and Economic Change, Bangalore, pp. 1-65, available at http://www.isec.ac.in/Agri%20Profile-Karnataka.pdf, viewed on January 8, 2019. Chandran, Arun B., and Anushree, K. N. (2016), “Climate Change and Sugarcane Productivity in Karnataka,” in Sunil Nautiyal, Ruediger Schaldach, K. V. Raju, Harald Kaechele, Bill Pritchard, and Kottapalli Sreenivasa Rao (eds. ), Climate Change Challenge (3C) and Social-Economic-Ecological Interface-Building, Environmental Science and Engineering, Springer International Publishing, New York, pp. 389–99. Environmental Management and Policy Research Institute (EMPRI) and The Energy Resource Institute (TERI) (2012), “Karnataka State Action Plan on Climate Change: 1st Assessment,” available at http://www.esocialsciences.org/Download/Download.aspx?fname=A2014512174118_35.pdf&fcategory=Articles&aid=5857, viewed on December 21, 2018. Gourdji, S. M., Sibley, A. M., and Lobell, D. B. (2013), “Global Crop Exposure to Critical High Temperatures in the Reproductive Period: Historical Trends and Future Projections,” Environmental Research Letters, vol. 8, no. 2, p. 024041. Hofstra, N., Haylock, M., New, M., Jones, P., and Frei, C. (2008), “Comparison of Six Methods for the Interpolation of Daily, European Climate Data,” Journal of Geophysical Research, vol. 113, no. D21. Hatfield, J. L., and Prueger, J. H. (2015), “Temperature Extremes: Effect on Plant Growth and Development. Weather And Climate Extremes,” Weather and Climate Extremes, vol. 10, pp. 4–10. Jogesh, Anu, and Dubash, Navroz K. (2014), “An Analysis of Karnataka’s Action Plan on Climate Change,” Mainstreaming Climate Change in State Development Planning, Working Paper, Climate Initiative, Centre for Policy Research, New Delhi. Koenker, R., and Bassett, G. (1978), “Regression Quantiles,” Econometrica, vol. 46, no. 1, p. 33. King, A. D., Alexander, L. V., and Donat, M. G. (2012), “The Efficacy of Using Gridded Data to Examine Extreme Rainfall Characteristics: A Case Study for Australia,” International Journal of Climatology, vol. 33, no. 10, pp. 2376-87. Lobell, D. B., Sibley, A., and Ortiz-Monasterio, J. I. (2012), “Extreme Heat Effects on Wheat Senescence in India,” Nature Climate Change, vol. 2, no. 3, pp. 186–189. Lobell, D. B., and Burke, M. B. (2008), “Why Are Agricultural Impacts of Climate Change So Uncertain? The Importance of Temperature Relative to Precipitation,” Environmental Research Letters, vol. 3, no. 3, p. 034007. Lobell, D. B., Hammer, G. L., Mclean, G., Messina, C., Roberts, M. J., and Schlenker, W. (2013), “The Critical Role of Extreme Heat for Maize Production in the United States,” Nature Climate Change, vol. 3, no. 5, pp. 497–501. Lobell, D. B., and Field, C. B. (2007), “Global Scale Climate–Crop Yield Relationships and the Impacts of Recent Warming,” Environmental Research Letters, vol. 2, no. 1, p. 014002. Luo, Q. (2011), “Temperature Thresholds and Crop Production: A Review,” Climatic Change, vol. 109, nos. 3-4, pp. 583–98. Powell, J., and Reinhard, S. (2016), “Measuring the Effects of Weather Events on Yields,” Weather and Climate Extremes, vol. 12, pp. 69–79. Rajeevan, M., Bhate, J., Kale, J. D., and Lal, B. (2006), “High Resolution Daily Gridded Rainfall Data for the Indian Region: Analysis of Break and Active,” Current Science, vol. 91, no. 3, pp. 296-306. Ramakumar, R. (2017), “The Agrarian Economy of Karnataka,” in Madhura Swaminathan and Arindam Das (eds. ), Socio-Economic Surveys of Three Villages in Karnataka: A Study of Agrarian Relations, Tulika Books, New Delhi. Rosenzweig, C., Elliott, J., Deryng, D., Ruane, A. C., Müller, C., Arneth, A., et al. (2013), “Assessing Agricultural Risks of Climate Change in the 21st Century in a Global Gridded Crop Model Intercomparison,” Proceedings of the National Academy of Sciences, vol. 111, no. 9, pp. 3268–73. Schlenker, W., and Roberts, M. J. (2009), “Nonlinear Temperature Effects Indicate Severe Damages to U.S. Crop Yields under Climate Change,” Proceedings of the National Academy of Sciences, vol. 106, no. 37, pp. 15594–98. Siebert, S., Ewert, F., Rezaei, E. E., Kage, H., and Graß, R. (2014), “Impact of Heat Stress on Crop Yield—On the Importance of Considering Canopy Temperature,” Environmental Research Letters, vol. 9, no. 4, p. 044012. Srivastava, A. K., Rajeevan, M., and Kshirsagar, S. R. (2009), “Development of a High Resolution Daily Gridded Temperature Data Set (1969-2005) for the Indian Region,” Atmospheric Science Letters, vol. 10, no. 4, pp. 249-54. Teixeira, E. I., Fischer, G., Velthuizen, H. V., Walter, C., and Ewert, F. (2013), “Global Hot-Spots of Heat Stress on Agricultural Crops due to Climate Change,” Agricultural and Forest Meteorology, vol. 170, pp. 206–215. Thornton, P. K., Ericksen, P. J., Herrero, M., and Challinor, A. J. (2014), “Climate Variability and Vulnerability to Climate Change: A Review,” Global Change Biology, vol. 20, no. 11, pp. 3313–28. Welch, J. R., Vincent, J. R., Auffhammer, M., Moya, P. F., Dobermann, A., and Dawe, D. (2010), “Rice Yields in Tropical Subtropical Asia Exhibit Large but Opposing Sensitivities to Minimum and Maximum Temperatures,” Proceedings of the National Academy of Sciences, vol. 107, no. 33, pp. 14562–67. Yu, K., Lu, Z., and Stander, J. (2003), “Quantile Regression: Applications and Current Research Areas,” Journal of the Royal Statistical Society. Series D (The Statistician), vol. 52, no. 3, pp. 331–50. Zhao, C., Liu, B., Piao, S., Wang, X., Lobell, D. B., Huang, Y., et al. (2017), “Temperature Increase Reduces Global Yields of Major Crops in Four Independent Estimates,” Proceedings of the National Academy of Sciences, vol. 114, no. 35, pp. 9326–31. Notes: *** Significance at p-val < 0.001, ** Significance at p-val <0.01, * Significance at p-val <0.05, and ^ indicates significance at p-val<0.1.